and media monitoring. So we do it for you. Turn your small brand into a big one. of your brands across the web, helping you act on every opportunity for growth. 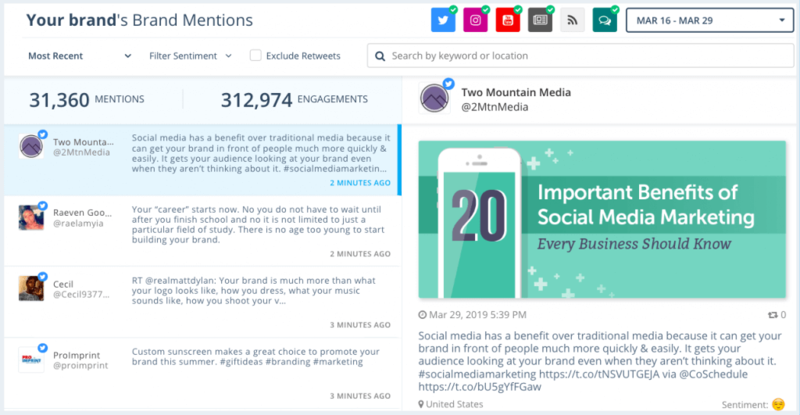 We’ve combined social listening with media monitoring to give you all mentions of your brand in a single inbox. Understand your audience at a glance, so that you can better cater your content to them. Lead the competition. Gain full access into how competitor social profiles are performing, their top content, mentions, wins and losses. Grow the engagement on your social media accounts using data. Understand the sentiment behind every post mentioning your brand, and compare brand sentiment scores. See when you are losing and gaining followers over time, and understand the triggers driving your following. See top posts from you and your competitors and understand the content leading the conversation. Gain full access into how competitor accounts and brands are performing online. Overlay brand data for two or more brands to see how your brand stacks up. Stuck with what to do next? Explore what other brands are doing and what's working for them for quick inspiration. How is BrandIQ different to the Keyhole Advanced Analytics Suite? The BrandIQ product is built specifically to monitor brands online. It collects brand mentions of your brand name, and tracks the brand’s social media accounts to see how they perform over time. The Advanced Analytics Suite is built as a flexible product that caters to campaign tracking, event monitoring, influencer management, and market research as well as advanced brand monitoring. The suite is a much more granular product, designed for advanced filtering, in-depth sentiment analysis and machine-learning-driven trends analysis.